My home waters for the spring and summer seasons are Gardiners Bay to Block Island Sound, including the huge rips known collectively as "The Race", in the middle of Long Island Sound. During these months we encounter a variety of fishing conditions from sight casting to stripers off the shallow flats of Gardiners Island to fishing the fast moving rips of Orient Point and The Race for both bluefish and stripers that are crashing bait on the surface. Sand eels are one of the predominate baits this time of year. We fish lots of clousers and deceivers along with some of the newer patterns. Poppers can always add to the fun. Floating to deep sink lines are all used. 9 and 10 weight outfits are most commonly used. I also have access to Florida style flats boat thru another guide out here if you are interested in polling the flats around Gardiners, sight casting to both stripers and blues. Flats fishing can be productive right into early fall. Late August to early September will see large numbers of False Albacore arriving with smaller numbers of Bonito. Both of these species are very hot fly rod fish and a lot of fun to catch. Come September I move both my boat and myself out to Montauk Point where I'll stay thru November. Of course the bass and the bluefish are all around this magnificent fishery during the fall run. Surface feeding by all four species occurs almost daily during the fall but lots of big bass still fall to the users of sinking lines. Dependent on water temperature the albies will stay to mid or late October when they leave for warmer waters. Bay anchovy fly patterns are the order of the day for these line burners. Come early November we always hope the herring arrive so we can continue to cast to schools of large bass busting the surface as they ravage these 10" baits. Camera & lots of film! 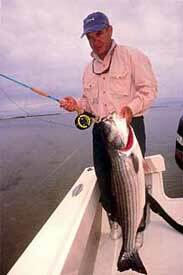 Tom with yet another fat striper! "I've fished with Captain Jim Levison. He's as capable and personable a guide as you'll find anywhere...on any water. You'll learn something new every time out and that makes every day of fishing with Jim a day to remember!"